ATTENTION! Here’s An Extra Event! 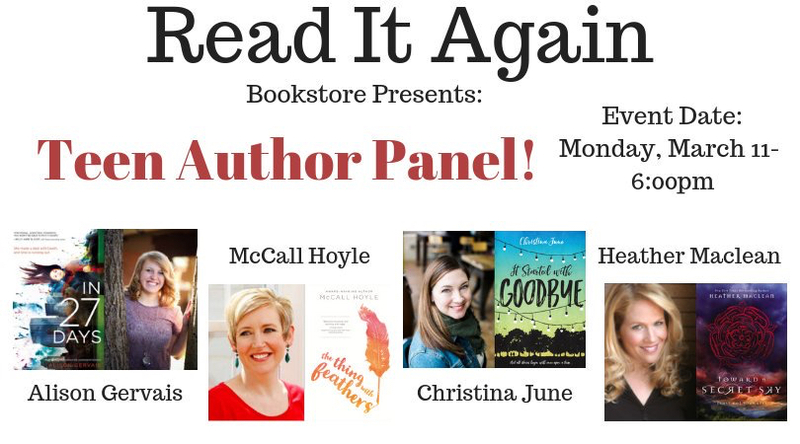 I am so unbelievably fortunate to be participating in a Teen Author Panel with these amazing authors at 6pm on March 11 at Read It Again in Suwanee, GA! McCall, Christina, and Heather are all fantastic authors, and I can’t wait to share a night of fun talking about our writing, reading, and so much more! Check out these links down below to get your copy of their books and come get them signed! Previous Previous post: ATTENTION! Upcoming Events! Next Next post: It’s Finally Here! A giveaway for IN 27 DAYS!